Reading Corner: Explore Your World - Read! Explore Your World - Read! Our classroom library is arranged by themes. Each basket has a label that states what is inside and has a picture to show what is inside. There are many different types of books with many different kinds of levels. The students also have their own books in our library as well. These are well-worn favorites. 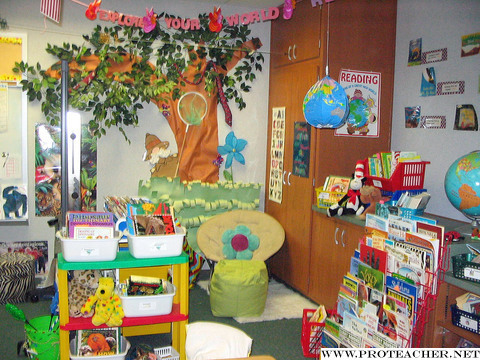 Students are encouraged to sit and relax and put their feet up or are encouraged to lay down and relax while reading. The tree is simply bulletin board paper and the leaves are fake greenery. The pillows and chairs were great finds at garage sales and at Wal-Mart. Most of my baskets came from Wal-Mart or Big Lots and the labels were simply made by importing pictures from the Internet.